German parentage unknown; her maiden name may have been Seegers or Siegert. Sister to Mrs. Sophia (Peter) Damm. Wife of William Wehmhoefer, married December 5, 1868. William Wehmhoefer died on June 27, 1886. 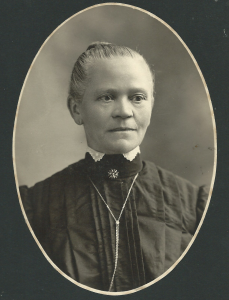 Wife of Frank Hoffman, married June 20, 1889. 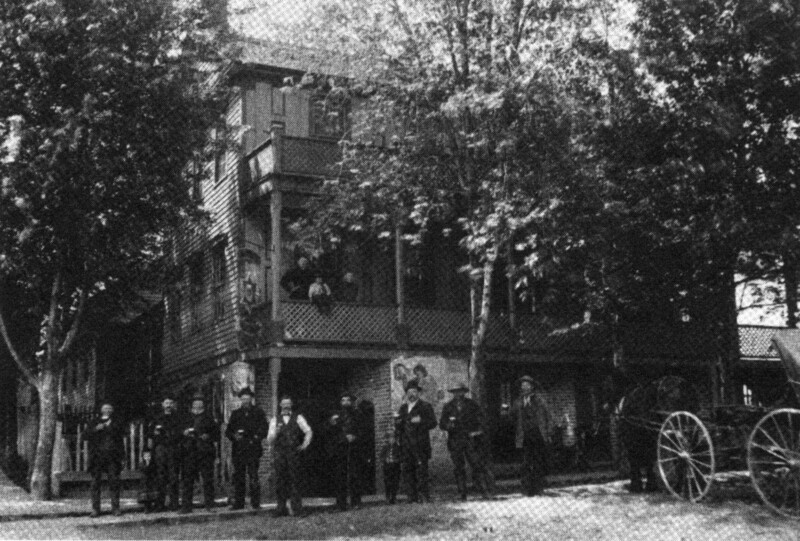 Around 1880, the Hoffman Saloon, as it was later known, was built on the corner of Gould and Penfield Streets by Mr. & Mrs. William Wehmhoefer Sr. This was an impressive three story structure. The saloon was located on the ground floor with a dance hall at the back and easy access off the sidewalk. The living quarters and parlor were on the second floor, with sleeping rooms on the third floor. It was operated by William until his death, then by Maria and her second husband, Frank Hoffman, and later by Carrie Hoffman. The building still stands today. 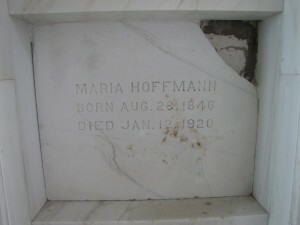 Maria married her second husband, Frank Hoffmann, on June 20, 1889. One daughter was born to this union, Miss Carrie Hoffmann. Maria was also step-mother to: Lena (August Schoenwald) John Hoffmann and Mary D. Hoffmann, from Frank Hoffman’s first marriage. 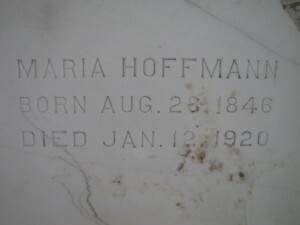 Mrs. Hoffman, nee Maria Seegers, was born August 28, 1846, at Hohnhorst Churchessen, Germany. She came to this country, settling in Chicago, in 1866. She was married to William Wehmhoefer in Chicago on December 5, 1868. To this union nine children were born, two dying in infancy, and Matilda, Mrs. William Westpahl, passing away on February 11, 1915. The surviving children, according to age are: Minnie, (Mrs. Herman Claus), Henry, William and Edward of Monee, Lydia (Mrs. Leonard Cole) of Steger, and Clara (Mrs. Martin Peters) of Monee. 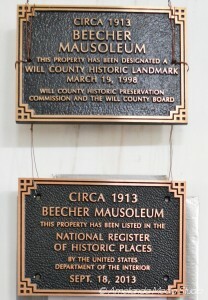 The deceased came to Beecher in 1884, where, on July 27, 1886, her husband William Wehmhoefer preceded her in death. She was married again on June 20, 1889, to Frank Hoffman. One child, Miss Carrie, was born to this union. This marriage was only of short duration, with Mr. Hoffman passing away March 9, 1892. Not quite well for over a year, she gradually weakened to such extent that about five weeks ago she was confined to her bed. Several doctors were called in consultation, a trained nurse engaged, and in addition to the attendance of the loving children, and especially Miss Carrie, all was done for her that human skill could offer, but with no avail. Her end came peacefully on Monday Jan. 12, 1920 at 3:50 p.m., in the presence of most of the children. Mrs. Hoffman was truly a model lady and Christian. She was loved universally by all her neighbors and friends. A dutiful mother, whose loving thoughts were first for her children, then for all who were dear to her. She was of a beautiful nature, charitable to all and a devoted member of her religious faith. The surviving mourners are: the children mentioned, Mrs. August Schoenwald and John Hoffman of Grant Park, brought into her second marriage; one sister, Mrs. Sophia Damm of Chicago, 15 grandchildren, 2 great-grandchildren, and a large number of other relatives. The funeral services were held, this afternoon, at 1 o’clock at the house and at 1:30 at St. Luke’s Church, Rev. G. Horst officiating. The pallbearers were the three sons and three sons-in-law, while the flower bearers were the grandchildren. The esteem in which the deceased was held was exemplified by the extremely large number of beautiful floral tributes. Rev. 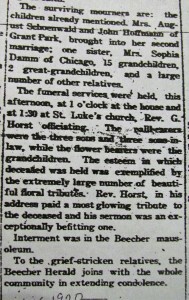 Horst, in his address paid a most glowing tribute to the deceased, and his sermon was an exceptionally befitting one. Interment was in the Beecher Mausoleum. To the grief-stricken relatives, the Beecher Herald joins with the whole community in extending condolence. 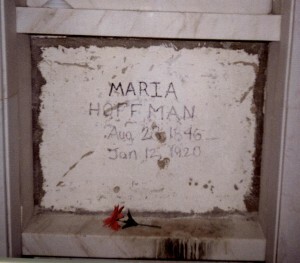 Note: Maria’s headstone was removed from her crypt front by vandals in the 1980’s. it was found laying on the floor with the right top corner broken. The dark stains you see on the ledge are from candles. The ledge has been cleaned and we re-installed the headstone in its proper place. One day we hope to replace the broken marble slab to give Maria a proper headstone again.